First, you’ll want to remove your downspout. Place your ladder underneath your gutter system and climb to the top. Remove the elbow that’s attached to your gutter’s drop outlet. After that, disassemble your downspout and set it aside. Next, unscrew the screws that fasten your gutter hangers to your fascia and remove them. Once all of the hangers are gone, remove your old gutters. 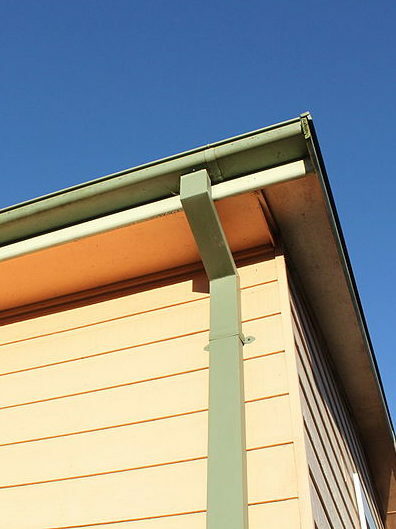 Inspect your home to make sure your fascia wasn’t damaged by the gutter removal. If it was, take the necessary steps to restore it before installing your new gutters. Measure your old gutters to determine how much gutter material, end caps, downspouts, and elbows you’ll need for your new installation. Using your snips, cut your new gutters to the correct length. Cut a two-inch notch in the front lip of the gutter so you can join the section with a corner piece. Measure about 1 ½” in along the corner and lay a bead of gutter sealant. Then, place the front lip of the corner over the notched front lip of the gutter. With your drill and 1/8″ drill bit, drill six holes around the seam of the two sealed pieces. After that, use your rivet gun to rivet the two pieces together. Place a dab of sealant over each rivet for extra hold strength. Next, measure your downspouts and transfer the measurement to the area of your gutters where you want to place them. When cutting your outlet holes, cut 1/16″ outside the traced line to make sure they fit securely. Drill 1/8″ holes in your outlet, then lay a bead of gutter sealant around the opening. Place your downspout in the outlet hole and rivet the two pieces together. Next, use your chalk reel to draw a sloped line along your fascia where you’ll hang your gutters. Line up the top of your gutters with your chalk line and attach them to your fascia using hex head screws every two feet. After that, slide your gutter flashing underneath your shingles and nail it down every two feet (make sure you overlap the sections). Reinstall your old gutter hangers (as long as they’re in good shape). Finish by installing your downspouts and making sure they direct water away from your home’s foundation.